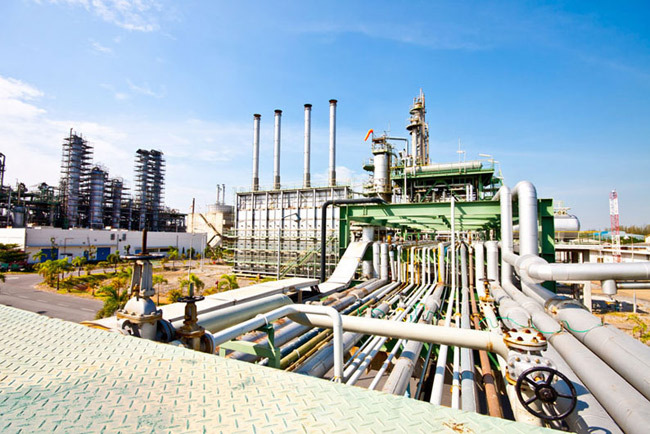 The new generation of fire-rated self-bunded fuel storage tanks for all blends of oxygenated fuels including methanol. A steel primary containment tank within a steel secondary tank with a unique, lightweight insulation technology called Steel Tank Institute of America (STI) Ingredient “B”. This is the innovative design of Fireguard™, a technology patented by the STI. Fireguard™ technology has advanced far beyond that of concrete-encased ASTs. The exterior steel wall provides superior protection against the elements and low-cost maintenance. Cracking concrete and spalling will never be a problem again with the innovative design of Fireguard™ Tanks. The thermal insulating material is super lightweight — 75% lighter than concrete — reducing shipping, installation and relocation costs. 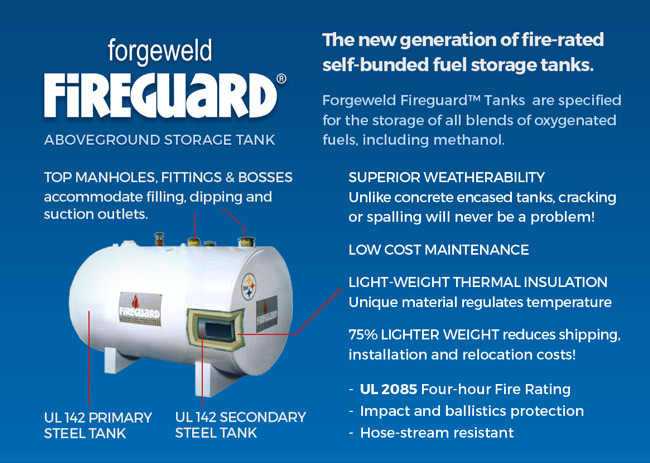 Fireguard™ tanks come in many more size options than most competitors. These include cylindrical or rectangular design, compartmentalised configurations, concrete pad designs for sites in Seismic Zone 4 and tank supports manufactured in accordance with STI’s UL Listings. The tanks are supplied in the dimensions below. Deliveries can be arranged. Both the primary and secondary tanks are equipped with emergency vents, an important safety feature that reduces the risk of explosion in the event of fire. The primary tank has a tested ability to maintain an internal temperature below a specified limit for four hours, reducing the risk of an explosion during a fire. A tested ability to prevent penetration of bullets into the primary tank, rendering it ballistics resistant. A tested ability to prevent leakage of the primary tank if impacted by a vehicle, lessening the risk of a spillage. A tested ability to prevent leakage of the primary tank or damage to the insulation material when impacted with a stream of water (a fire hose) for two and a half minutes, making the storage of flammable liquids safer. Fireguard™ has been fully tested by the US standards authority Underwriters Laboratory in accordance with UL 2085 and has both the Fire-resistant Type and Protected Type listing for Insulated Secondary Containment Aboveground Storage Tanks. South African National Standard (SANS) 10131:2004 allows the use and installation of Fireguard™ Tanks in South Africa. Forgeweld Fireguard™ ASTs are fitted with top manholes and fittings and bosses to accommodate filling, dipping and suction outlets. Units can be provided with an access ladder or platform. 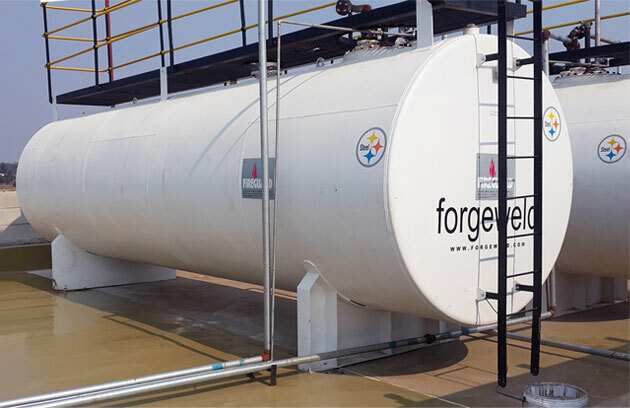 The primary and secondary tanks of Forgeweld Fireguard™ ASTs are manufactured from South African carbon steel plate, complying with Grade 335JR. The external surface of Forgeweld Fireguard™ ASTs is usually white epoxy but this can be modified as required.